If your kitchen is like mine, then you know what I mean when I say that oven space is at a premium around the holidays – especially when it comes to Thanksgiving. That big bird takes up a lot of room! 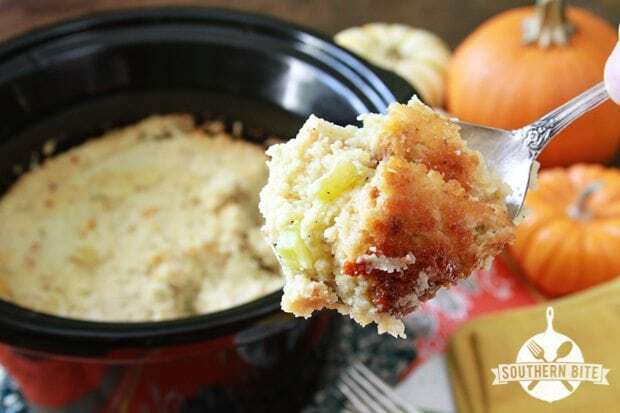 That’s why I started doing my Cornbread Dressing in the slow cooker several years ago. It works great because it frees up valuable oven space and the slow cooker method always yields dressing that is moist and delicious. And this is the recipe that I used to use in the oven so there no harm in putting this mixture in a casserole dish if you’d like. You’ll need to bake it at about 375 degrees F for 45 to 44 minutes if you decide you don’t want to go the slow cooker method. Y’all enjoy! Once you try this, this will be your family’s favorite. Just wondering how much cornbread makes 8 cups…a 9 X13 pan?? Looks so good!! I do have a question for you. Do you use yellow, or white cornbread? Just wondering what your preference was. We’ve always used yellow, but I was curious about the white. I made cornbread for the first time using white meal and really liked it. Thank you for all the hard work on your page. I really enjoy reading it…….and all of the recipes of course! I’ll be honest, it just depends on what’s on sale. 🙂 I usually use yellow though. Thanks, Tammie! Is there a vegan version which I can sub something else for chicken broth/soup? WOW! This looks so gooood! Not waiting for Thanksgiving…..making this weekend. Thanks for a fantastic recipe! LOL! I hope you enjoy it! Let me know how it turns out. My family has always used rubbed sage in their dressing, would adding traditional spices ruin the recipe?? Then again I’m not sure how much to add.. My mom’s dressing recipe was ruined, we have tried to duplicate but always turns out just not quite right.. Would love to try this for sure! Adding sage would be just fine. My mother and grandmother never used it, so I don’t. But, I think 1 to 2 tablespoons of ground sage would be good. need just a scoonch more, it’s probably enough. 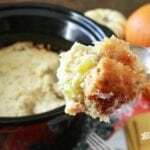 I’ve been making my dressing in the crockpot for a few years now, and it definitely frees up that oven for the other sides….your recipe reminds me of my dad – he wouldn’t let Mom put any spices at all in the dressing. Just salt and pepper! I do put a little poultry seasoning in mine though. And they always used homemade cornbread. Thanks for posting this, it’s a keeper! Thanks, Deb! You are so welcome! Like another poster, I can’t wait until Thanksgiving to make this. I’m going to make it this weekend as a trial run before “turkey day”. I enjoy your recipes so much! They remind me so much of the wonderful dishes my relatives made when I was growing up. Thank you for the nostalgic recipes that bring back fond memories of large family gatherings on Sundays and holidays! Thanks, Debra! I hope it turned out great for you! Looks like a great recipe!!! I am definitely going to try it. 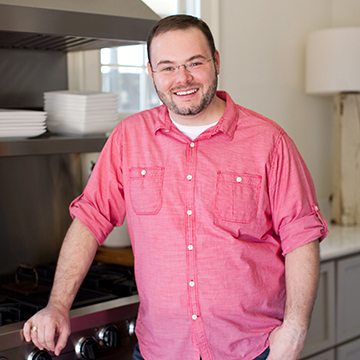 You are an awesome Southern cook!!! Can’t beat the South for knowing good food LOL. Could you use Pepperidge Farm cornbread crumbs? Thanks so much, Judy! I bet you could use the breadcrumbs you might just need to add some additional broth as those will be drier that fresh cornbread. You won’t lose much moisture with this method like you would in the oven, so you might want to make it with less liquid than your traditional method. Enjoy! This is a great idea. I was just wondering if chopped eggs could be added and if so when should they be? Thanks. Absolutely! You can simply add them in the beginning when mixing everything else up. I found a recipe online last year for slow cooker dressing, and I think your recipe looks a lot better than the one I used. Forget waiting until the holidays, I love dressing is year round, and I’m making your version this weekend. 😀 Thanks for another awesome recipe!!! Thank you, Denise! I hope you’ll enjoy it! I love your site! 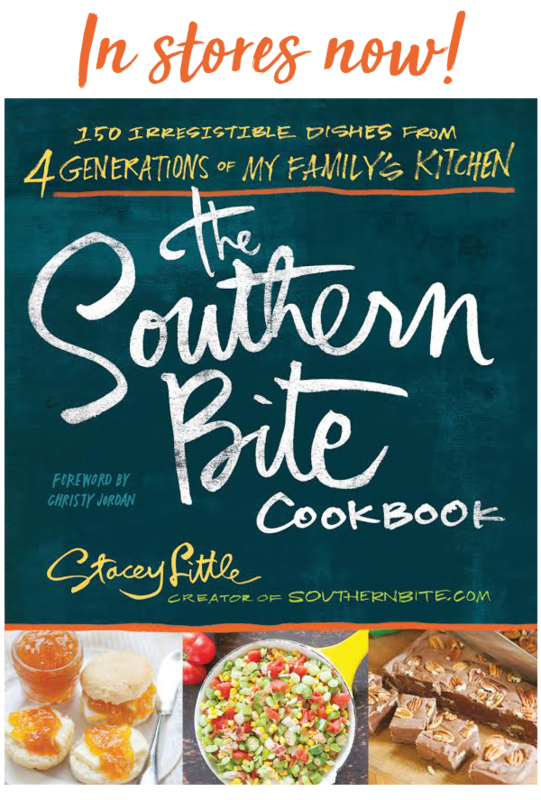 Great recipes to try and of course Southern!!! looks like a keeper for Thanksgiving! Much to my family’s surprise I made cornbread dressing in the crock for Thanksgiving 2013. It was a great hit. Definitely use sage and a few other ingredients too. Go ahead and try it in the crock, you will be surprised! I make this dressing in my slow cooker year round, except I pull the meat off a rotisserie chicken and add that to the slow cooker too. My family loves it! Sounds like an easy way to make it a complete meal! A lady mentioned sage. I use a can of cream of chicken with herbs in place of regular cream of chicken. It adds a great flavor! Love your website and recipes. do u use white or yellow cor meal to make your cornbread? It doesn’t really make a huge difference. Which ever you have on hand will work just fine. Just wondering if anyone has used Jiffy sweet cornbread in this recipe? Looks awesome!! I am used to making a 9×13 pan in the oven!!! This will be on my table this year!! Would Jiffy cornbread mix be too sweet to use ? Would this work with dried Pepperidge Farm cornbread stuffing pieces? Sure! You might want to add a little extra broth, though. I’ve never made cornbread except with Jiffy. Do you have a cornbread recipe? Can this recipe be doubled? Will it still turn out? Yes, if you have a large enough slow cooker. You might also need to add some additional time. Hi, what size crockpot would you recommend for this recipe? Thanks. 4 to 5 quart should work just fine. Small onion u say and that would be how much in cups? I use jiffy corn bread how many should I make? I also like sage u said 1 to 2 TBS for this recipe? I use raw sage sausage in my dressing. Wonder if I could use it as well in the crockpot? I don’t see why not so long as you ensure the sausage gets cooked through. Awesome! So glad it turned out great for you! Happy Thanksgiving! Love this recipe! Just a hint, cooks, don’t put sugar in your cornbread and, if possible, don’t use Jiffy. Too sweet! Thanks for this recipe, Southern Cook? fantastic Thanksgiving. We all have much to be thankful for!! Thanks so much! You, too! My recipe that I have made for years is basically this except mine called for chicken in it. Instead of using regular cornbread I use the Tex-Mex Cornbread that has some seasoning already in it so I don’t add any salt or pepper. My family has always expected me to bring this to wherever we were celebrating Thanksgiving. This year I will try in the crockpot and free up my oven! I forgot to add that instead of cutting up onion and celery I just buy a bag of frozen seasoning blend (onion, bell peppers, celery) and add to this. So fast and easy to fix. Love anything that saves time! I would like to use Pepperidge Farm cornbread stuffing pieces too. You said you would add extra broth. What amount of broth would you think be needed for this dressing that needs to be moist? We like dried sage, what amount would I use for this recipe. I too have a ninja cooker, still use it as a slow cooker setting? My mother in-law used egg in her dressing. No egg? I’ve never done that, so I’m not really sure on the amount of extra broth. It really depends on how much of the stuffing you use. I’d start with a very small amount of sage. You can add more but can’t take it out. Yes, slow cooker setting and no egg. I absolutely LOVE this recipe but I have gotten addicted to my pressure cooker lately. I have a slow cooker setting on it, but I was hoping to be able to cook it a little quicker. Has anyone tried this in the pressure cooker? If so, what setting and How long did you cook it? Trying your recipe for first time, can it be made the night before then cooked next day? How many boxes of Jiffy Cornbread does it take?